As a textile artist I am always experimenting with fiber. I try to only work with organic products and stay away from plastics and faux items. As many of the main characters in the illustration are animals, I especially avoid twine made from animal gut or leather. If I use any feathers, wool or hair, they are from trusted sources as no one wants to incorporate any negative vibes or harmed animals into the creation. 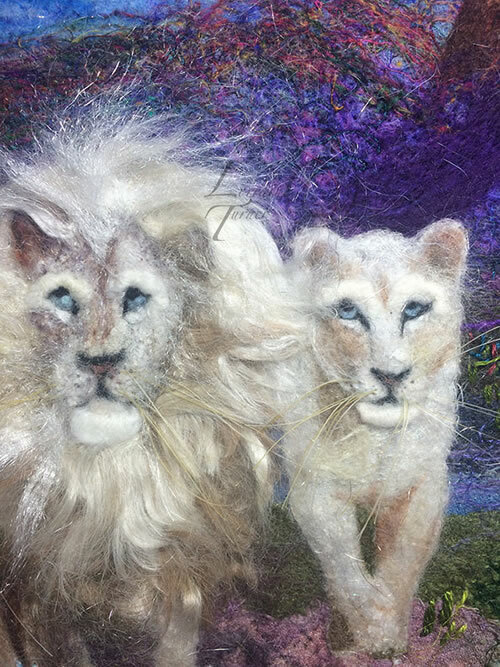 My white lion paintings are created using llama, alpaca, merino wool, horsehair and lamb locks. 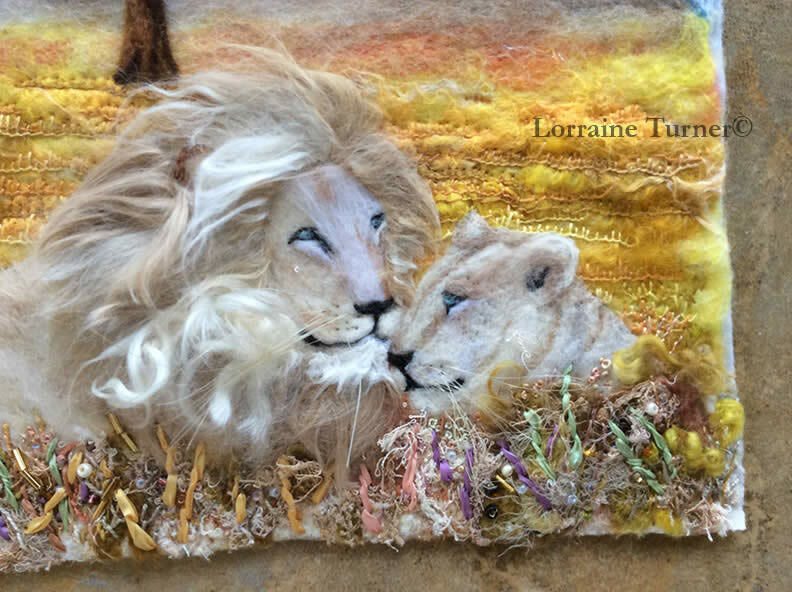 I work for hours on each piece and the textiles help build and construct the coat and mane of these majestic beings. Beautiful? Yes, however a hazard if you are not very diligent in mounting and framing the work to be displayed. This is why every painting I ship, I include a warning label. This craft uses wool and natural fibers. moths can be quite destructive. on the fibers — especially the mane! I recently sold a painting to a person who left the artwork on the dining room table for a few minutes and upon returning found her dog had destroyed it. He was so thrilled to chew on this newfound toy! So, as you continue to discover new textiles that help your artwork to really shine, be very careful to include a warning on every piece. This will save the recipient and the lovely animal that only wanted to sniff and chew any stress. Keep playing with fiber and always remember – together we are students for life.